This is a quick review of the foreign film Battle for Sevastopol which is a great 2015 biographical-like (based on a ‘true story’) film about a young Soviet Ukrainian named Lyudmila Pavlichenko, a young lady who joined the Red Army to fight the Nazi invasion of the USSR. Over time during her enlistment she became one of the deadliest snipers in World War II. 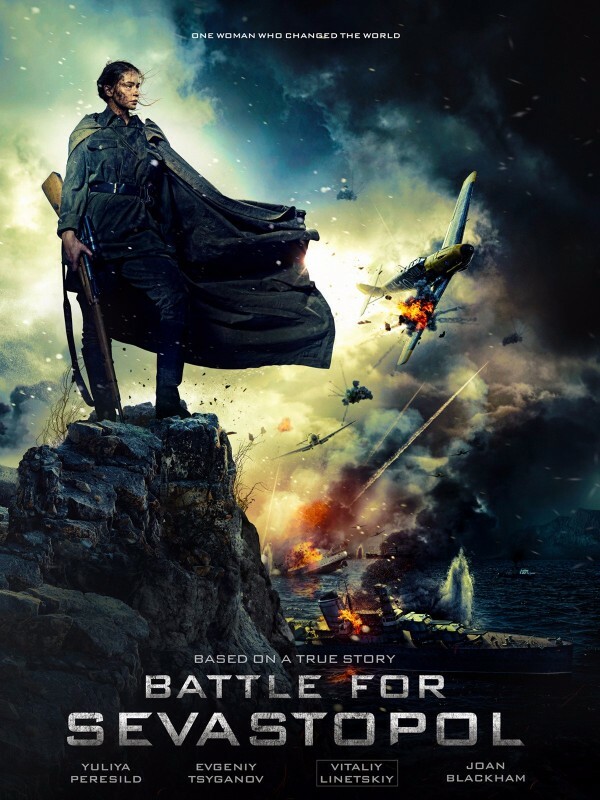 The film is directed by Sergey Mokritskiy and stars Yulia Peresild as Pavlichenko. The film was a joint Russian-Ukrainian production and came out in theaters in those countries in April 2015. Two weeks later it screened at the Beijing International Film Festival. The film takes place in multiple time lines. It begins with a post-war event when Eleanor Roosevelt (Joan Blackham) visits Lyudmila Pavlichenko during the former first lady’s 1957 trip to the Soviet Union. We then experience Pavlichenko’s story as it’s told to Roosevelt through flashbacks to 1942 when Pavlichenko toured the United States with Roosevelt. Basically, after the German invasion of the USSR, Pavlichenko becomes a sniper in the 25th Rifle Division. She fights in the Battle of Odessa and eventually she takes part in the defense of Sevastopol. After she amassed 309 confirmed kills, she is sent to the United States to campaign for American support and it’s here when Eleanor Roosevelt invites her to the White House, and the two become friends. To be honest with you, despite the fact that the majority of the film is subtitled, I enjoyed watching it. I enjoyed the journey of young Pavlichenko from when she leaves home, to joining the military, to being discovered she had a “knack” for shooting a rifle. Watching her tenacity to do her job, to push through the obvious challenges of being a soldier and a woman, earns her her accolades of who and what she was. In a male-dominated world, it was hard to deny her skills and hence, she was allowed to do what she did best. Of course, being war, it's not always a pretty picture, because mingled in with her flashbacks of her job, we are privy to the various mental challenges of being in a war, plus how she faced the overwhelming social odds was a true gem of a story to watch/read. This is about the unbearable horror of war seen through her eyes as she dealt with loss, fear, courage and death of dear friends. Despite being a fiction depiction, it comes away feeling like a documentary or her own biography. The trailers make it look like an action film but it's much more than that. The action is only the wrapper to the core or heart of the film. Despite being subtitled, and watching it on my phone while on the train during my work commute, I still came away enjoying the premise. Yea, if a movie can pass muster from a commuter's experience, it's worthy. If you get a chance, and you’re tolerant of subtitles, or aren’t on a moving transit system, it’s a good film to take some down time with. IMDb users gave the film a 7.2/10 rating.